UPDATE: Mahalo nui to each of you who has returned your release forms. As of November 20, 787 DHHL applicants have agreed to participate in this important study and 337 household interviews have already been completed. If you have submitted your release form to us, you should be contacted by Urban Institute or NORC very soon. 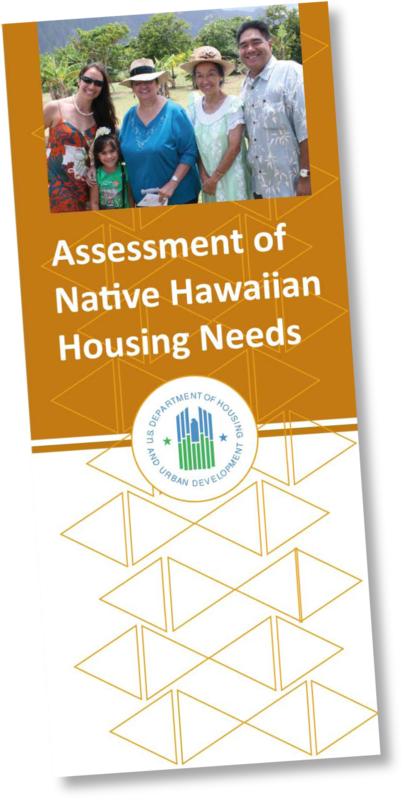 The U. S. Department of Housing and Urban Development (HUD) is preparing to launch an important study on Native Hawaiian housing needs entitled “Assessment of Native Hawaiian Housing Needs.” DHHL applicants have the opportunity to have a significant role in this major initiative. This study is designed to gather information about the families and housing conditions in our community so that HUD, and other agencies, can ensure its programs and policies address the real housing needs experienced by individuals like you. If you receive this informational packet, you are one of 5,000 DHHL applicants randomly selected to have an opportunity to participate in this study. If you choose to participate and are selected as a study participant, you will have an in-person or phone interview that will last about 45 minutes. These interviews are planned for early summer this year and will be conducted by local interviewers hired by the HUD Research Team. The HUD Research Team includes the Urban Institute, Econometrica, Inc., NORC at the University of Chicago, and Support Services International. You will be asked questions about how many people live in your home, features of your home(such as number of rooms, whether you have air conditioning, etc. ), what you consider an ideal housing unit, your thoughts on home ownership and renting, and other similar questions. You will also receive a gift of $25 cash to thank you for your time. In order to participate, you must complete the enclosed “Release by Consent of Applicant” form and return it to DHHL by July 21. By signing this form, you allow DHHL to provide the HUD Research Team with your contact information (name, home address, phone number, and e-mail address) that we have in your file. If you are randomly selected to participate, a member of the HUD Research Team will contact you directly to make arrangements for your interview. This study is very important, and your participation is vital. This is the first time a study as in-depth as this has been conducted on Native Hawaiian housing needs, and opportunities like this are extremely rare. To participate, the first thing you need to do is sign the consent and return it to DHHL by July 21. If you have any questions, please take a look at the information on our website, or contact Ms. Dre Kalili at (808) 620-9486. This Assessment of Native Hawaiian Housing Needs is one part of a larger nation‐wide study, The Assessment of Native American, Alaska Native, and Native Hawaiian Housing Needs. This study overall was first conducted in 1996, and the current study plans to update the assessment by presenting a complete overview of the housing needs of American Indians, Alaska Natives, and Native Hawaiians. The study is conducted by a HUD Study Team, contracted by HUD and made up of the Urban Institute, Econometrica, and NORC at the University of Chicago. Why is HUD doing this study? The U.S. Congress directed HUD to undertake this study because it recognized that better data is needed in order for the U.S. Congress and HUD to better address the housing needs of native families across the country. What is the expected outcome of this study? The study seeks to assess the current housing conditions in Native American, Alaska Native, and Native Hawaiian communities. If the study is successful, it will help shape policies and programs in ways that enable tribes, Alaska Native villages, and the Department of Hawaiian Home Lands to more effectively use existing resources to improve housing conditions. It also will provide important information that will allow HUD to serve these communities more effectively. What does the Native Hawaiian assessment entail? Prospective participants will receive a letter from DHHL between May and July 2014. The interviews will take place from July through September 2014. Discussions with housing organizations and service providers will also take place from July through September 2014. The final report is expected to be completed in 2015.
Who participates in this study? The 500 interview participants will be randomly selected from the Department of Hawaiian Home Lands (DHHL) residential application list, and each will receive an invitation letter and information about the study. Participation is optional. If an applicant chooses to participate, he/she will sign and return a consent form. Why is participation in the survey limited to DHHL applicants? The study is designed to focus on the housing needs of Native Hawaiians who reside in Hawaii who are eligible to receive housing assistance from HUD that targets Native Hawaiians. DHHL applicants represent a group of Native Hawaiians that could be served with funds in the HUD Native Hawaiian Housing Block Grant (part of NAHASDA, the Native American Housing Assistance and Self‐Determination Act) administered by DHHL, but who are not currently direct recipients of federal housing assistance targeted to Native Hawaiians. What if I am selected and choose to participate? If you choose to participate, an interviewer from the HUD Study Team will contact you to make an appointment to meet you at your home to conduct the survey. He/she will show you proper identification and will also have additional materials to share with you about the project. Wherever possible, interviews will be conducted by Native Hawaiian interviewers hired by the Study Team. If it is more convenient for you, the interview may be completed by phone. If you agree to participate, the survey will take about 45 minutes and you will receive $25 as a token of appreciation for your time. The survey questions are easy to answer. You will be asked about how many people live in your house, features of your housing unit (such as number of rooms, air conditioning, etc. ), your preferences for an ideal housing unit, your thoughts on homeownership and renting, and other similar questions. Your answers will help us understand the housing needs of Native Hawaiians. Your participation is voluntary, and if you don’t want to answer certain questions, that’s OK, too. What is DHHL’s role in this study? DHHL agreed to assist the HUD Study Team contact 5,000 DHHL applicants to invite them to participate. DHHL also worked closely with the HUD Study Team to design the study survey so it recognizes the unique context and particular housing needs of Native Hawaiians who live in Hawaii. While DHHL played an important part in the planning of the study, no one at DHHL will know whether you participated in the study or not. The U.S. Congress made funds available for this study. In 2011, Senator Daniel Inouye appropriated funding to make sure that in‐person interviews could be done in Hawaii. No state funds or DHHL trust funds are used to conduct this study. How will HUD distribute the final reports? The final report will be sent to all of HUD’s tribal partners and to DHHL, as well as to the U.S. House of Representatives and U.S. Senate Appropriations Committees and the Office of Management and Budget in the White House. It will also be made publicly available via the PD&R website, HUDUser.org.